The Heart’s Invisible Furies was that good and it was not only my favorite book of 2017, but also my favorite book of the past several years. And, because my overall 2017 reading wasn’t all that great. The Heart’s Invisible Furies didn’t have much competition. This year, I had more trouble picking my #1 book. And, not because it was significantly less good than The Heart’s Invisible Furies, but more because my overall 2018 reading was SO much better than last year (I attribute this to tracking my best and worst recommendation sources using my Rock Your Reading Tracker)! There was just more competition for the top spot. I actually considered over half of my top 10 as candidates for my #1 book of the year. The reason I picked Waiting for Eden is that it’s the book that affected me the most. I even re-read/re-skimmed it for an upcoming guest podcast discussion (more on that later) and it affected me just as much the second time around. It’s not a book for everyone (you have to be okay with getting metaphorically punched in the stomach multiple times), but if you you’re comfortable with the gut-punching, then definitely give it a try. This year, I’m not only sharing my own favorite books, but I’m also sharing the Sarah’s Book Shelves Facebook Group members’ favorites! You can join the Sarah’s Book Shelves Facebook Group (where I share my unfiltered thoughts, sneak peeks of blog posts and members’ trade book recommendations amongst each other) by supporting the blog at the $3/month level on Patreon (more details here). Finally, I’ve brought back the high school yearbook-style “Superlatives” from previous years (2017, 2016, 2015, 2014)! Not surprisingly, many of my Facebook Group’s favorites of they year lined up with mine! And, a number of the books that almost made my list did make m Facebook Group’s list! We’re all sharing recommendations in the Facebook Group, so you’d expect to see a lot of overlap. 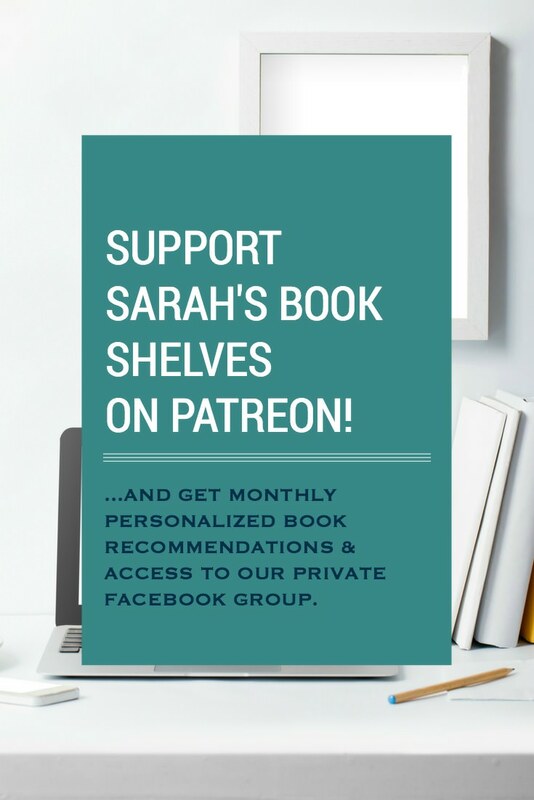 Get access to the Sarah’s Book Shelves Facebook Group by supporting the blog for $3/month on Patreon (more details here)! I loved this one too…it just didn’t make my top 10! I sampled this one, but ended up not reading it. I really liked this one, though it’s a hard read. Just didn’t make my top 10. I’ve read 2 of those and loved one and felt meh about the other. I wonder if listening to it hindered my enjoyment of it. Well now I’m curious which ones! You surprised me with your number one pick, though I knew Eden would be on the list. I’m also struggling a bit for which book to put on top, but will need to make the call soon. I agree that this year there have been many excellent books, but maybe no superstars? It looks like we’ll end up with half our books in common. I love that the Facebook picks are all over the place. Lots of variety in what appeals to us all. I wouldn’t say there were no superstars…maybe just more superstars than usual where I couldn’t really decide if one was better than the other? Last year was such a blah year for me overall that HIF had no competition. And, it was also the best book I’d read in years. So, both those factors together made it easy. We’re picking favorites already?! But I still have so much reading left to do this year! I guess I should put Waiting For Eden on my TBR list. I’ve seen it around, but I don’t know much about it. Excellent choices! I’ve read and loved six from your list. I haven’t put my own list of favorites together yet, though I have a few in mind that I know will overlap with your favorites. I love seeing what rises to the top after a year of reading! Lots of great books on those lists! 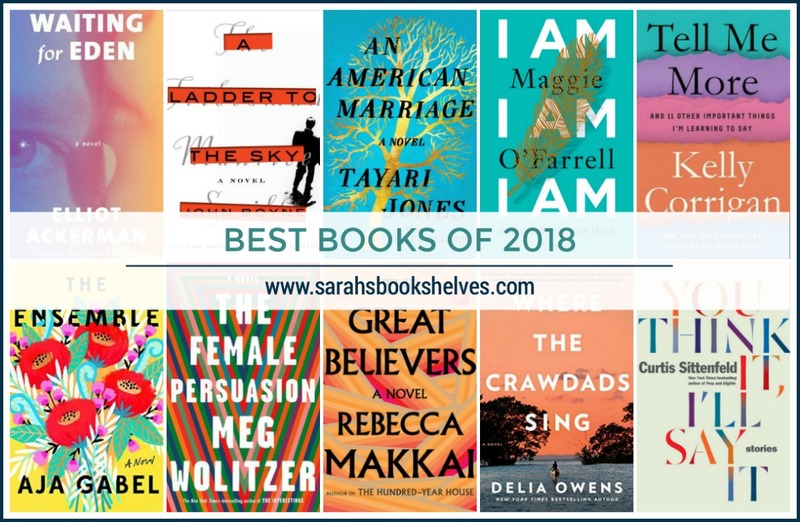 I’ve read four of the ones on your list, and The Great Believers and I Am, I Am, I Am are definitely on my list, too (along with Calypso and Bad Blood). I’m still hoping to read An American Marriage and A Ladder to the Sky before the end of the year, too! So many good books I want to get to in 2019. I’m saving this post! I loved An American Marriage and really enjoyed The Ensemble. Some of yours I haven’t gotten around to yet, but am planning to read in 2019. I just got I Am, I Am, I Am in the mail, so I can’t wait to pick that one up. The only book I read from your list was An American Marriage, but I didn’t love it as much as everyone else seems to. Your superlatives are a great idea! Wonderful list! Have a very happy 2019! I loved American Marriage, I Am, and Tell Me More. The Great Believers is high on my TBR list, and I’m seeing a lot of John Boyne on these lists so I’ll have to look him up. Happy New Year! I haven’t read any of these yet. It’s amazing how many great books come out every year! Nice list Sarah. I too liked An American Marriage, Where the Crawdads Sing, and The Female Persuasion. I’d like to read The Great Believers which looks really good too. fyi — I enjoyed your first podcast episode and will rate it highly soon. Thanks for all the work you do. I’m pleased you list the books on the podcast … that helps quite a bit. I think I want to check out the Winter Soldier sometime which your guest author mentioned. Thank you so much!! So glad you enjoyed it. Let me know what you think of Winter Soldier!